Thanks Lyn for this wonderful review. Those quotes made me laugh out loud, particularly the one about the Royal Asiatic Society tea! You're welcome, Mike. Are you a Barbara Pym fan? Knowing Pym makes the tea scene even funnier. Yes, on the basis of the only one I've read, Lyn - it was Some Tame Gazelle - really liked it. The subtleties of the relationship between the sisters were very fine. I love letters too so it was good to read these. As I said, Winifred's generosity & good humour make them so much fun. Another one I'll have to read! To date I've only read South Riding of the novels but I keep picking up Poor Caroline and putting it back down again. I think Holtby is one of those authors that I'll feel disappointed about when there's no more to read - like Stella Gibbons. I haven't read PC but it's on the tbr shelves. Land of Green Ginger will be next, I think. Her short stories are also good. I listened to them on audio years ago, read by Susan Jameson, which was excellent. I love that quotation about what I guess we should call a "bun struggle" at the Royal Asiatic Soc. Totally Pym-ish. What a gorgeous book - onto my list. I always knew Barbara Pym based a lot of her fiction on real life but I was amazed to come across such a Pymish scene. I'm sure it must happen more often than we realise! This sounds right up my street. 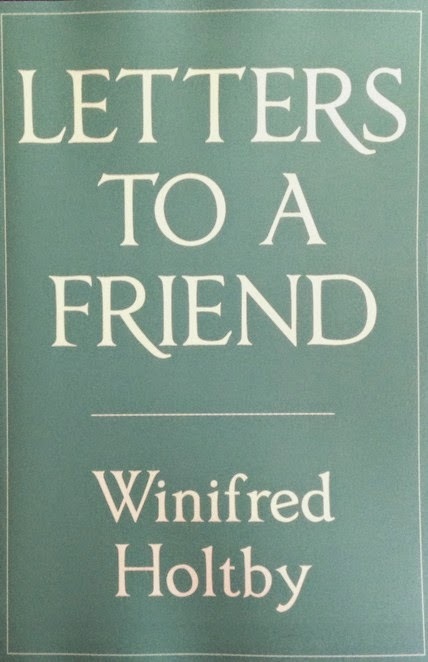 I was so moved by Testament of Friendship (and of course Testament of Youth) when I read them as a young woman and Winifred's early death was so sad. Yes, very like Barbara Pym! Testament of Youth is one of my favourite books & Vera's diaries are also very good. I'm looking forward to reading more of Winifred's fiction now.